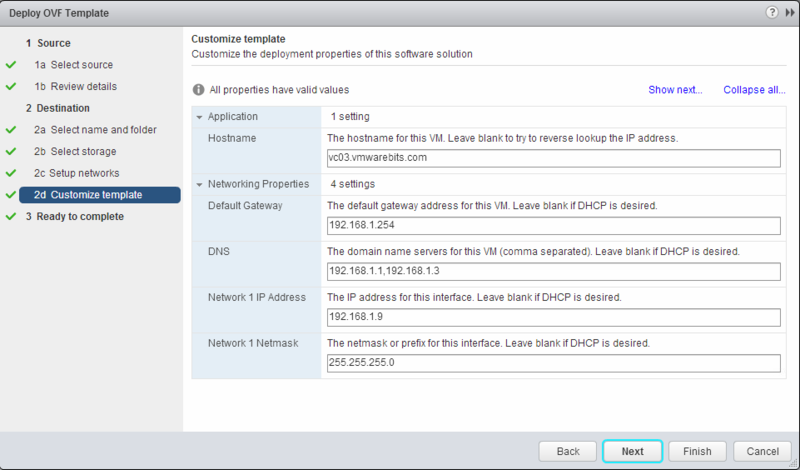 Why is the vSphere Web Client your best choice to import the appliance? Because it allows you to customize the appliance during the deployment which allows you to configure the hostname and fixed IP-address. Because of this the appliance will be ready for the remainder of the setup without any additional steps. This article is based on vSphere and vCenter version 5.5. The requirements for the steps in this article are that you have ESXi running with at least one vCenter server deployed and the vSphere Web Client installed. For the vSphere Web Client you must also have installed the Client Integration Plugin because without it you cannot import or export appliances or upload/download files from your local system. 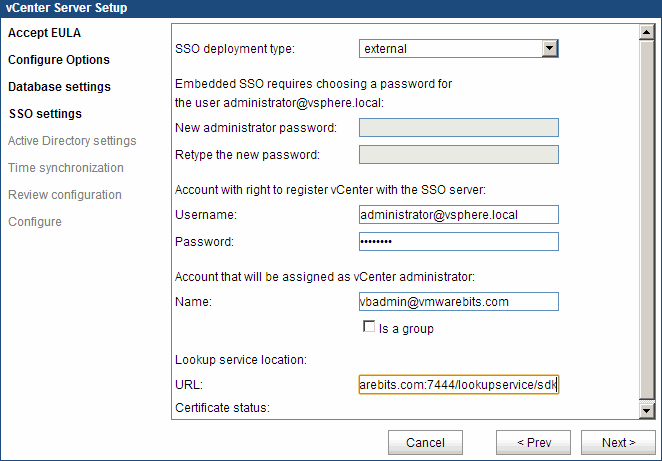 A link to install the plugin is available at the bottom of the vSphere Web Client login. 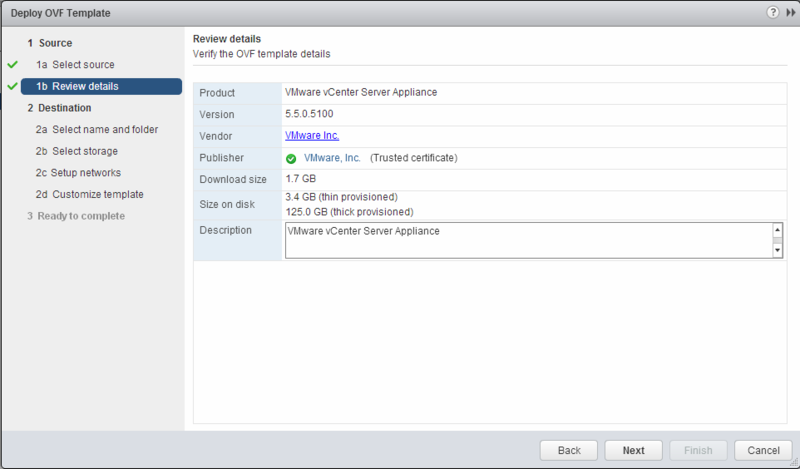 And of course you have downloaded the vCenter appliance. (http://www.vmware.com/go/download-vsphere) Having DNS for the domain you are installing the host and vCenter into is also highly recommended. To start the deployment login to the vSphere Web Client, select your Datacenter, Host or Cluster where to import the appliance into and select Deploy OVF Template. In the deployment wizard browse to the download file of the appliance on your system. The wizard will show you the details of the appliance. Important to notice here is the disk size it will consume if imported in the thick provisioned format. If you do not want to pre-allocate, in this example, 125GB then later on in the wizard remember to select thin provisioning. The final step of the deployment wizard is to provide the customization details. The image below shows what you need to provide such as hostname and IP-configuration. Very important is to provide a FQDN for the hostname if you ever plan to add this host to Active Directory. Only providing a host name such as VC02 wouldn't work, VC02.YOURDOMAIN.COM would work. In the summary of the import wizard you can review the information you have entered and select to start the machine after deployment, which is a good idea because now you can click Finish, go have a break and when you get back the vm is started and ready for performing the next steps. Since you have provided the server name and IP-cofngiuration yourself you already know those details and can access the vCenter administrative web portal at http://<yourserver>:5480. When accessing that location with a browser the first page will be a certificate warning. Unless you will be adding your own signed certificate you will keep this message. Next login to the appliance with the default username and password. When you first login you must accept the License Agreement. Next the vCenter Server Setup wizard will be started. You can go directly into the setup wizard because all the host details have been provided during deployment and your host has the correct name and address. 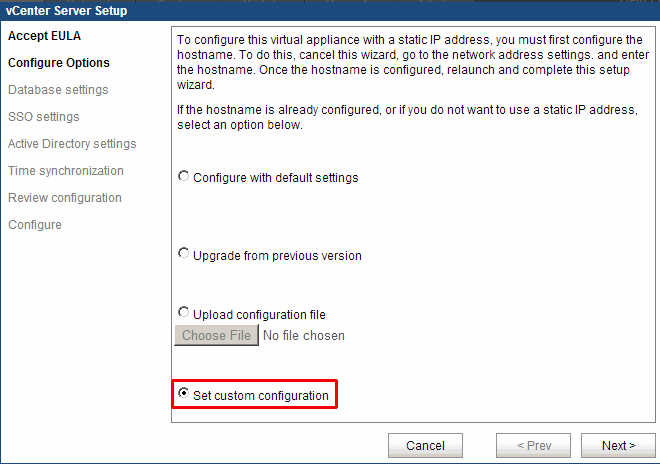 In this article I have selected the Set custom configuration method because that allows me to connect this new vCenter server into the Single SignOn configuration of an existing vCenter server. The first step in the setup wizard is to choose a database. In this example I have chosen the embedded database which you can use in production environments up to 5 hosts and 50 virtual machines. Your other choice is to connect to an existing Oracle database server where you have created a database for vCenter. You will be required to accept the SHA-1 thumbprint for that server before continuing. 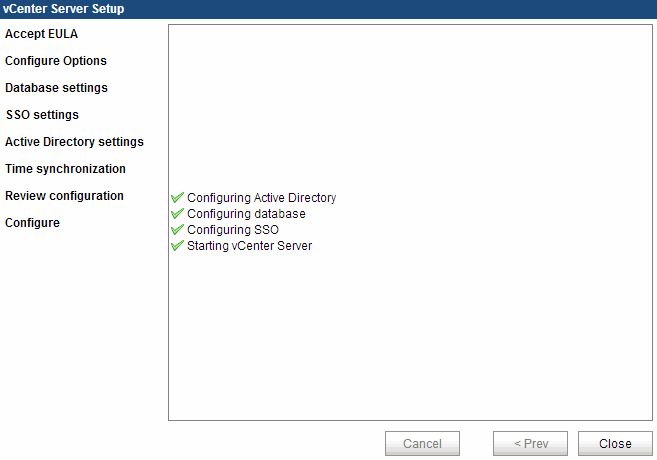 The final steps are to add vCenter into an Active Directory domain and configure time synchronization. In the last screen of the wizard review the details and click Finish. Wait five or ten minutes for the setup to complete. Note: Don't forget to change the root-password for the appliance. Also pay attention to the Password expiration policy, the default setting is to expire the password after 90 days. 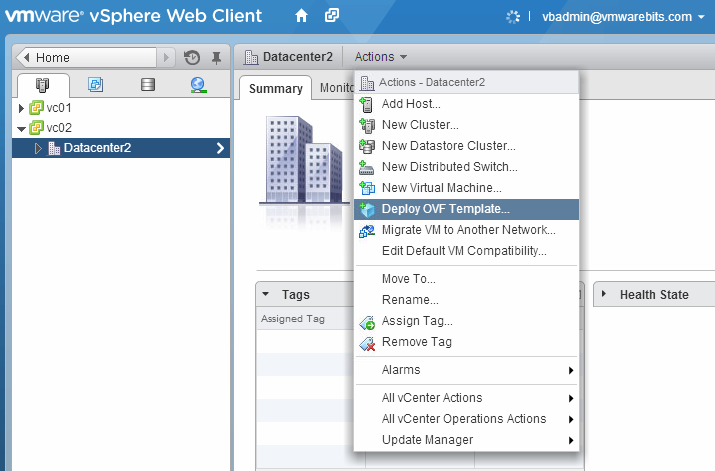 Or use the Web Client from your earlier vCenter server that already used Single SignOn where the new vCenter server will now be available in the list of vCenter servers. The next step would be to add a license to your vCenter server or leave it running with the evaluation license for 60 days. After that create a datacenter-object and add your ESXi-host to your inventory.